I hit a question block, two Super Acorns appear. Mario turns into a squirrel. To me this feels like the most natural thing in the world. "Urgh," grunts Heizy, my wife. "Why are these greasy old men always playing dress up? It's really creepy." My wife. She doesn't hate video games. She tends to tolerate them. In the ‘pat-me-on-the-head you-have-fun-with-your-little-games' way. But Mario? She actively hates Mario. Mario is supposed to be harmless. He's a family friendly plumber with gigantic accessible eyes, dungarees plastered in primary colours, a singing Italian falsetto. It's-a-him! Mario. Your buddy. Wahoo! So kawaii! "He's just a weird middle-aged man chasing after a pretty blonde princess. I hate him. I hate his stupid moustache." My wife hates Mario in a way I really can't comprehend. Mario is a person I have zero distance from. I grew up with the guy. He's a family friend. He comes round for BBQs, he's attended my birthday parties for as long as I can remember, he turns up at Christmas; an amicable foreign Uncle bearing gifts. He's a bundle of faux-Italian joy. But from Heizy's perspective, from the outside looking in, he's the man you warn your children about. An aging, unmarried tradesman with dark, disturbing secrets disguised in a voice that's little too high-pitched, nestled in a moustache that's a little too thick. He harbours an unquantifiable menace. He is not to be trusted. I don't know how I managed to convince her, but Heizy and I are playing New Super Mario Bros. U together. It's a little experiment. Once she forgets she's controlling a potential criminal tradesman with a dark secret hidden in his face bristles, I think she starts to have fun. I pick her up and throw her around the levels, which I think is hilarious. It's funny the things we take for granted. Whilst playing Mario, not once do I take my finger off the run button. That feels alien and strange. Mario is supposed to be played at this pace, at this speed. But Heizy is happy to totter around at walking pace. She's in no rush. We almost run out of time in every single level we play. But I'm having a blast. "I found that secret, not you. Me!" Or even dared to imagine. Mario exists in a strange universe where it's completely fine for a tubby middle-aged man with a moustache to dress up as a bumble bee and get away with it. It doesn't even push the boundaries of our expectations. Some of us even find it cute. "Why is he dressed up as a BEE? He's an old man!" I honestly don't know. And I'd prefer not to think about it too deeply thank you very much. "The princess got kidnapped again, why doesn't he just dump her. She's so stupid. Urgh." Despite her unique distance, it's interesting just how much Heizy does pick up. She takes the piss out of Mario's ludicrous kidnapped Princess angle, in the same way every bloody web-comic or smartarse comedian does, but it goes beyond that. 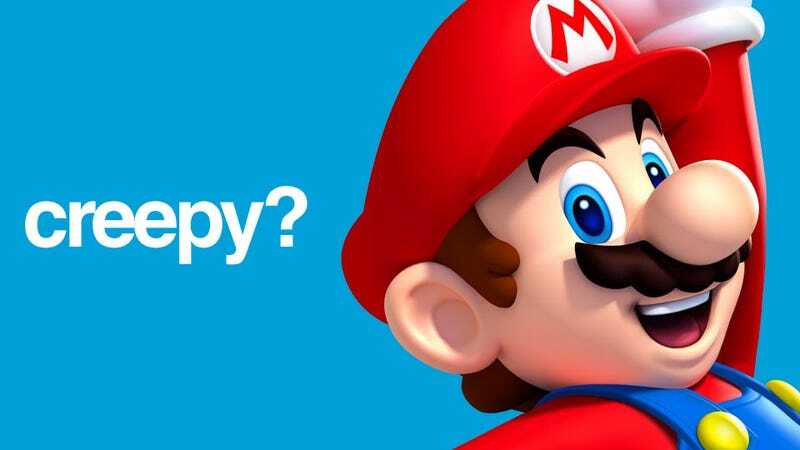 Despite her lack of experience with Mario, she knows enough to realise that New Super Mario Bros. U isn't exactly the most innovative entry into the series. "These games are all the same, aren't they?" Yes, they are. Especially this one. But that's the fun of this little mission. I am playing the most Mario-like game ever made, with the person in my life who most hates Mario. This will, almost certainly, end well.